It’s been nearly five decades since MIPA first offered a statewide day of celebration and study of journalism in Missouri. J-Day 2018 marks the 49th day MIPA members will meet on the MU campus to hear a keynote speaker, attend workshop sessions and celebrate scholastic journalism and explore journalism as a collegiate major or career path. MIPA would like to thank you for considering presenting a session at the well-known J-Day, or possibly considering jumping in on the ground floor of the expansion of MIPA’s workshops to the regional level. In the fall of 2016, MIPA held it’s first regional workshop at East Central College, near St. Louis, thanks to a partnership with ECC faculty. In 2017, this fall regional workshop headlined amazing speakers and doubled its attendance numbers! The MIPA Board of Directors is encouraged by this show of interest. 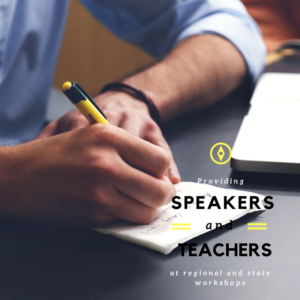 This year, we are planning a potential winter retreat for journalism advisers, and hoping to find speakers or teachers willing to present at possible regional workshops in other areas of the state in the next calendar year. The directors feel outreach is essential to supporting our many teachers and student members spread around Missouri. We welcome any expertise and any topic of relevance to middle and high school student journalists and their teachers/advisers. If you’d like to see a taste of what’s been taught before, visit this link. To volunteer to speak or teach at one or more of MIPA’s workshops, please email [email protected].